With the added buzz building from the first LAUNCH in February at the Helipad, LAUNCH 2 landed with around 250 creatives coming together for one night of networking fun. 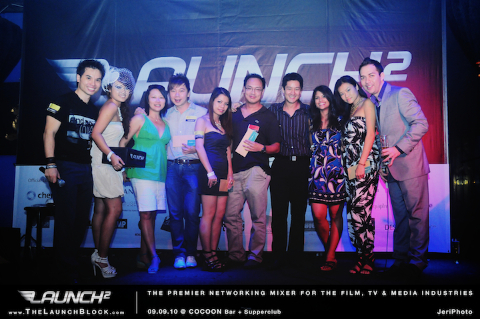 LAUNCH 2 sported a new venue with an open air registration at Indochine's Cocoon Bar + Supperclub at Clark Quay. The Vibe was happening from the moment attendees registered and walked the 'Pink Carpet' and got their photos snapped in front of the new look 'Launch' backdrop. Many were then caught chatting to camera with host Steve Lai, the new face of ESPN Star sports. Loads of great Prizes were given away from all the wonderful sponsors who supported the event. Old friendships were rekindled, new friends were made, collaborations set in motion. It was as one stated an 'epic' evening enjoyed by all. Thank-you to all who helped and contributed to helping organising the event - Jasmin Wong for her amazing administrative powers, organisation and sourcing the wonderful talent for the evening and her hard work managing the Registration Desk! Laura Kee for all her great support and assistance with various jobs that needed to be done to make the event a success. And everyone else who offered their help - no matter how small - you all contributed to help make LAUNCH 2 a success! Thank-you! 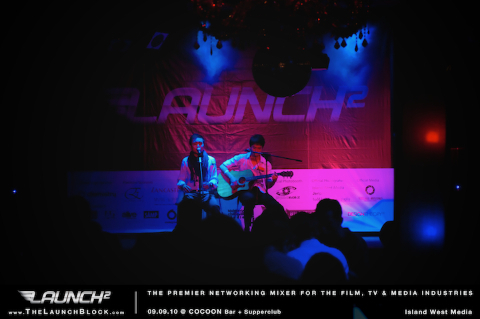 I hope that all those who attended LAUNCH 2, came away with some great contacts who will provide opportunities to collaborate and create new projects and work in the future for the advancement of our Film, TV & Media Industry in Singapore! 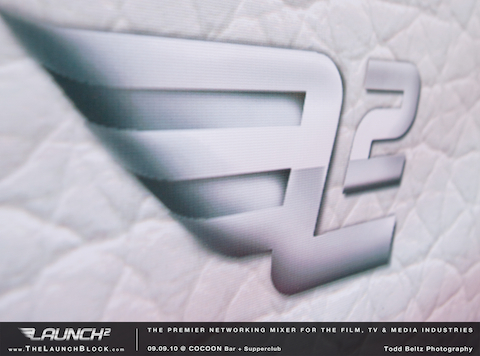 Get ready to Kick Start 2011 with LAUNCH 3! A big thank-you to the wonderful sponsors who helped make the event possible and of course providing the wonderful prizes. Simon Wong of Chemistry Team for coming up with the new fresh Launch Logo, designing the membership cards and Launch Photography Backdrop. Indochine for being the official venue sponsor and providing the delicious food served on the evening. Bryannz Fan of Eurocuffz & Imagine Entertainment who not only sponsored the LAUNCH 2 Backdrop but provided some stylish cuffs and ties for prizes. Lancaster for providing over $1000 worth of skin care products for the lucky door prize. Marvin from Photobotz for setting up the LAUNCH 2 Photobooth - A new concept bringing SLR quality to auntomatic photobooth and printing out photos on the spot. - check out the fun photos taken on the evening. Billy Yuen and his team from Vizuall Studio for filming the event - watch out for the LAUNCH 2 Video coming soon! William Lai (Island West Media), Jeri (Jeri Photo) and Todd Beltz (Todd Beltz Photography) for capturing all the great 'moments' on the night on camera. Gupson Pierre from Attitude Dance Studios for providing 2 Free Salsa courses plus 50 Salsa Courses at 20% off. Chris from Muse B'Art for her gift of a FREE makeover valued at $288 Plus 5% Discount on any product at MUSE b'ART retail for LAUNCH Membercard holders. And All the wonderful Media and Partner Sponsors who supported the event and help spread the word!!! AADB - Jason & Wendy for helping spread the word and their generous giving of 6 year Memberships for talent and production crew. Alive Not Dead - Thanks to Patrick and Raffi for being a Media sponsor and providing the cool Alive Not Dead T-Shirts for prizes! AdAsia - Thanks to Allein Moore for helping spread the word to the Advertising World. 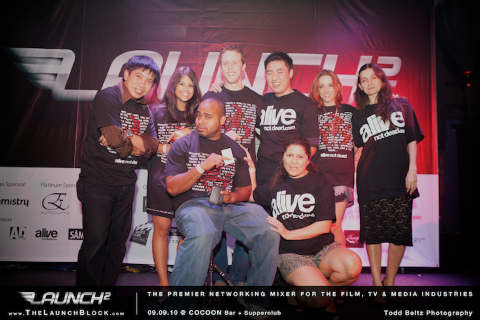 Nic Chee, Olivia Loh Ing and Sueanne Teo of Sinema for spreading the LAUNCH 2 word. Tushar Ismail & Word of the Actor for support and getting the word out!